I don't understand how it's possible to have a beautiful day and then it's snowing again! 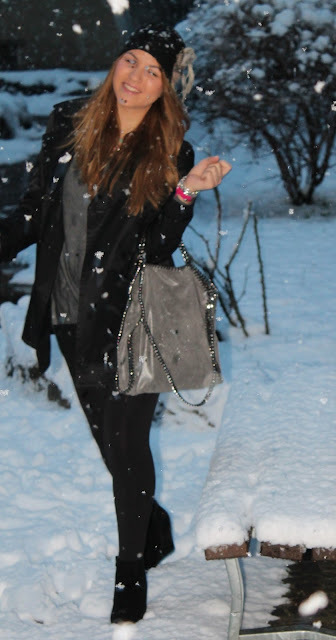 However I played, as always, under the snow with my friends and I dediced to wear comfy and casual. What's the plan for you week-end? If you don't want to miss my updates follow me on Facebook, Instagram and Twitter. Non capisco come sia possibile passare da una splendida giornata di sole, con un cielo terso, ad una ''bufera'' di neve! Ma quanta, quanta ne è scesa? E allora, ancora per poco spero, giochiamo con la neve! Voglio salutare velocemente questo inverno, non troppo freddo, poiché attendo impaziente la primavera con i suoi toni pastello e sfumature chic! Quali sono i programmi per il week-end fanciulle? Grazie Ragazzi siete sempre di più! Che belle foto..la collana è fantastica!! This sounds drastic but as long as you pay due care and attention when carrying the task out the removal should happen without a hitch.